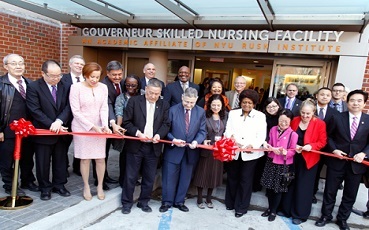 New York City Health and Hospitals Corporation (HHC) President Ram Raju, MD, today announced the completion of a $257 million expansion and modernization project at Gouverneur Health, our healthcare facility that includes a 5-star nursing home and a community health center serving Manhattan’s Lower East Side. The last phase of construction creates a larger, modern 295-bed nursing home designed with a home-like environment and a focus on sub-acute and rehabilitative medicine. The modernization also includs a new ambulatory care pavilion that opened in 2011 to expand primary care and preventive health services, and improves the physical and therapeutic environments. Dr. Raju was joined by HHC Gouverneur Health officials, U.S. Rep. Nydia Velazquez, State Assembly Member Sheldon Silver, State Senator Daniel Squadron, NYC Council Members Rosie Mendez, Margaret Chin and community representatives to mark the completion of the nursing home phase of the project at a ribbon cutting ceremony today on the HHC Gouverneur Health campus on Manhattan’s Lower East Side. HHC Gouverneur Health, at 227 Madison Street, primarily serves the communities of the Lower East Side and Chinatown. The modernization project expanded the skilled nursing facility and also included the construction of a new 13-story building that houses a five-story ambulatory care pavilion and an eight-story tower that rises above the pavilion. The total space grew from 330,000 to 450,000 square feet. Pun Yin, a Master of Feng Shui, provided consultation throughout the design process to enhance the environment through use of color and light. The last phase of construction marks the opening of an additional 85 new beds to the skilled nursing facility, which recently received the top “5 star” rating from the Centers for Medicare and Medicaid Services (CMS). The nursing facility can now accommodate 295 residents. It embraces a design that moves toward a more homelike environment, with private bedrooms in single and double-room suites, large, open dining areas, and comfortable community spaces, some featuring fireplaces. The new design also includes a private entrance to the nursing facility to enhance the experience of patients and their family. A typical skilled nursing facility floor is made up of four “communities” of 10 patients each to foster relationships with other residents and the care team. The public spaces are specially designed to allow residents to host visitors, family and friends in comfortable, cheerful settings, and creates a physical environment that supports smaller communities of residents on each floor. The ambulatory care center is projected to accommodate more than 250,000 outpatient visits a year. A comprehensive array of services is provided on-site, including adult medicine, Women’s Health, pediatrics, behavioral health, dental, podiatry and ophthalmology. The ambulatory care center now features a 30,000-square-foot Women and Children’s Center, as well as a state of the art digital imaging center with a new CT scanner. The new center also features an expanded entrance, and four-story atrium with more comfortable public seating and waiting areas. HHC Gouverneur Health was the first facility within HHC to be designated as a Patient Centered Medical Home. Earlier this year HHC Gouverneur Health was one of six large Diagnostic and Treatment centers to be reorganized with 33 smaller primary care community and school based clinics into one new community health center designated by the federal government. The new Gotham Health, Inc. demonstrates HHC’s role as a large outpatient care network committed to preventive care to keep communities healthy. The project was managed by the Dormitory Authority of the State of New York (DASNY) and was constructed by the Hunter Roberts Construction Group. The project was funded by the City of New York, with additional grants from the Lower Manhattan Development Corporation, the Office of Manhattan Borough President, the New York City Council and the U.S Department of Housing and Urban Development (HUD).